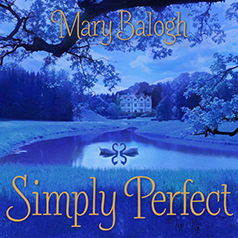 In New York Times bestselling author Mary Balogh's final installment in the Simply quartet, headmistress Claudia Martin will find her well-ordered world jolted by love when she meets a man who would make the perfect husband . . . for somebody else. Contains mature themes. Tall, dark, and exquisitely sensual, he is the epitome of male perfection. Not that Claudia Martin is looking for a lover. Or a husband. As owner and headmistress of Miss Martin's School for Girls in Bath, she long ago resigned herself to a life without love. Until Joseph, Marquess of Attingsborough, arrives unannounced and tempts her to toss away a lifetime of propriety for an affair that can only lead to ruin. Joseph has his own reasons for seeking Claudia out. Instantly, irresistibly attracted to the dedicated teacher, he embarks on a plan of seduction that leaves them both yearning for more. But as heir to a prestigious dukedom, Joseph is expected to carry on his family's legacy. And Claudia knows she has no place in his world. Now that world is about to be rocked by scandal. An arranged marriage, a secret that will shock the ton, and a man from Claudia's past conspire to drive the lovers apart. But Joseph is determined to make Claudia his at any cost. Even if that means defying convention and breaking every rule for a love that is everything he has ever wanted—a love that is perfection itself . . .